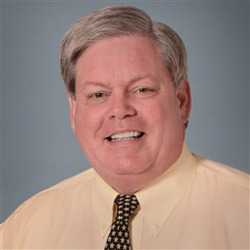 William M. Fesmire, MD is a physician board certified in pediatrics who attended medical school at the University of Tennessee Center for the Health Sciences and completed his pediatric training at LeBonheur Children's Medical Center through the University of Tennessee. Dr. Fesmire is a past president of the Memphis and Mid-South Pediatric Society, served as Chairman of the Department of Pediatrics at Baptist Memphis for six years, and has served on the board of the March of Dimes and numerous positions at LeBonheur during his pediatric career. What he loves most about being a pediatrician is watching his patients grow up and achieve successes, as well as sharing wisdom with their parents. He is also currently an elder at Germantown Presbyterian Church, where he teaches adult Sunday School. Dr. Fesmire has courted his wife Karen since they were 18 years old. They have a daughter who is earning a PhD in psychology from St. John's University in New York and a son in the Memphis University School class of 2016. Dr. Fesmire and his son attended Wrestlemania 25 and Super Bowl 50! In 1995, Dr. Fesmire was invited to caddy for Loren Roberts in the par 3 tournament at the Masters! His was the group behind Arnold Palmer, Jack Nicklaus and Gary Player. During his second year of Pediatric Residency, Dr. Fesmire was on the Wheel of Fortune with Pat Sajak and Vanna White! In 2014, he was elected to the Oakland High School Football Hall of Fame.